I read this article and found it very interesting, thought it might be something for you. The article is called Fadnavis Has Promised Land Titles To Tribal Farmers. But Maharashtra Has A Bad Record https://www.indiaspend.com/fadnavis-has-promised-land-titles-to-tribal-farmers-but-maharashtra-has-a-bad-record-27398/. Kamli Babu (85), a tribal farmer from Dahanu in Palghar district, at Mumbai’s Azad Maidan on March 13, 2018. She was among 35,000 farmers who had walked 180 km from Nashik to Mumbai to demand a better deal for the impoverished farmer community. 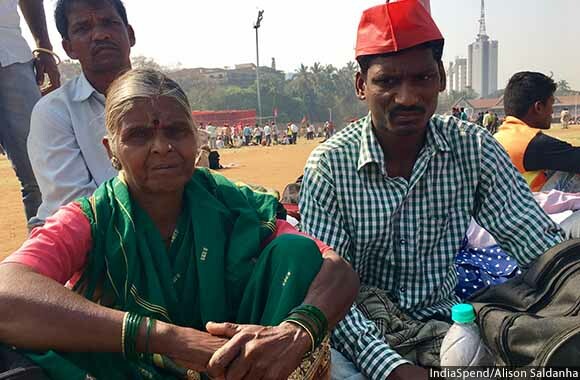 Mumbai: With a wooden staff in her right hand and a communist flag in the left, a diminutive, 85-year-old woman stood tall in the Azad Maidan sports ground. Kamli Babu, an adivasi (tribal) farmer who works as a farm hand for part of the year, had walked 180 km, covering 30 km each day under the harsh early summer sun, to be a part of Kisan Long March. A peaceful protest march organised by the Akhil Bharatiya Kisan Sabha (All Indian Farmers Association), affiliated with the Communist Party of India-Marxist (CPM), the march began on March 5, 2018, at CBS Chowk in central Nashik with some 15,000 farmers. Over the course of the week to March 12, 2018, their numbers more than tripled as more farmers and agricultural labourers joined in along the route. Their destination: Mumbai. Their aim: to get the attention of the state government. Their demand: a fairer deal for the struggling farm sector. Faced with a public relations disaster, Maharashtra chief minister Devendra Fadnavis met with a delegation of the protesting farmers on March 12, 2018. Immediately thereafter, he announced that all the farmers’ major demands had been accepted and would be fulfilled in six months. The government would expand the eligibility criteria for its farm-loan waiver scheme introduced in 2017 to ensure all deserving farmers would get relief, the chief minister said. Tribals who till land that they do not own would be given land titles under the Forest Rights Act of 2006, provided they could provide proof of residence from before 2005. Pensions and similar allocations would be increased. And a committee would be formed to advise on the best way to ensure minimum support prices (MSP) for farm produce, an issue already touched upon in the union budget for 2018-19. “The government now has six months’ time. If they do not meet the demands of the farmers, the next stage of this protest will not stay confined to farmers alone. It will be a mass movement,” said Sitaram Yechury, CPM general secretary. The state’s past record is anything but inspiring. 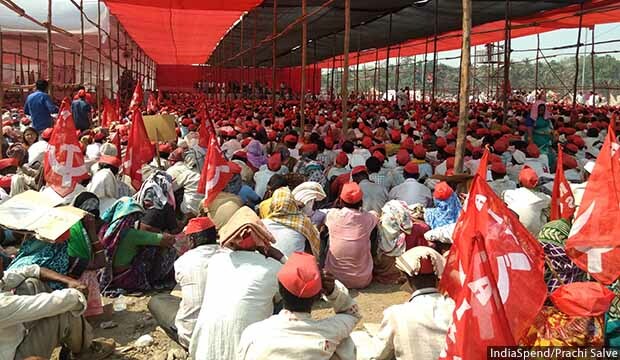 95% of protesting farmers who participated in the Kisan Long March were landless labourers and tribal cultivators. However, it rejects nearly two-thirds of all claims of community or individual tribal ownership of forest land, shows an IndiaSpend analysis of tribal ministry data. Of the 364,358 claims received until October 10, 2017, the state had rejected 64% (231,856 claims). Most states do not explain why claims are rejected. Those that do, often cite as the most common reason the lack of documents to prove the claimant has been cultivating the land in question. In fact, the Forest Rights Act (FRA) of 2006, under which claims are processed, makes it clear that documents should not be insisted upon. Across India, scheduled tribes are India’s poorest people, with five of 10 falling in the lowest wealth bracket, IndiaSpend reported on February 28, 2018. About 93% live in rural areas and are dependent on agriculture, mostly of the subsistence variety. Their literacy rates (59%) are significantly lower than that of the general population (74%), and in 86.5% of tribal homes, the monthly salary of the highest-earning member is less than Rs 5,000 ($76), IndiaSpend reported on July 2, 2016. Tribal communities practicing settled agriculture suffer from various problems, which government reports such as this one have acknowledged: unproductive and uneconomical holdings, land alienation, indebtedness, lack of irrigation facilities, lack of power, absence of adequate roads and transport, lack of access to bank credit facilities, seasonal migration to other places for wage earning, and lack of extension services and education hindering their ability to modernise. The FRA was brought into force in 2006 to reverse such marginalisation of tribals and forest dwellers by helping them secure their rights over forest land and community forest resources. It can secure the rights of over 200 million tribal people belonging to more than 170,000 tribal villages, according to this 2016 report by Oxfam-India and the Rights and Resources Initiative, an international non-governmental organisation. However, in the 12 years since the enactment of the FRA, only 3% of the minimum potential of community forest rights have been achieved, the report says. It estimates the minimum potential at 85.6 million acres, excluding Jammu & Kashmir and India’s northeastern region. This denial reverberated across Azad Maidan. “With no ownership, anybody can come claim our land. What about our rights?” asked 33-year-old adivasi farmer Dattu Sakaram Walamba (right). “In Surgana district, the forest department has reclaimed the land on which people have been working for several years now, by planting trees in the field. We do not want the same to happen to us,” said Nana Chahale, a 34-year-old adivasi farmer from Nashik district, whose family has been working a piece of land since the 1970s. “We have been protesting for land rights since 2010,” he added. In June 2017, also in response to farmers’ protests across the state, the Fadnavis government had announced a loan waiver scheme that would cost the state exchequer Rs 34,000 crore ($5.2 billion). Since 2017, nine other states--Madhya Pradesh, Rajasthan, Uttar Pradesh, Punjab, Haryana, Karnataka, Tamil Nadu, Andhra Pradesh and Telangana--have witnessed similar farmer agitations demanding loan waivers. On March 13, 2018, Fadnavis said the scheme has directly benefited 80% of the farmers found eligible, a total of 4.6 million. However, when the scheme was announced, the government had intended to target 8.9 million farmers, nearly double its current achievement. Meanwhile, the chief minister also assured farmers of a better policy for minimum support prices (MSPs). Earlier, Indian finance minister Arun Jaitley had announced in budget 2018-19 that new MSPs would guarantee 50% returns over and above the farmers’ cost of production. Neither of them has clarified the definition of ‘cost of production’. The protesting farmers have demanded that the Maharashtra government fix MSPs as per the recommendations of the 2006 M.S. Swaminathan committee report. The report had suggested that cost of production be calculated by including “visible components” such as seeds, fertilizers, hired labour and irrigation costs as well as, crucially, “invisible costs” such as family labour, interest on fixed capital and rental value of owned land. However, whether this formula will be used has been doubtful because the central government had told the Supreme Court in February 2015 that it could not deliver on this formula, as Mint reported on April 1, 2015. Chief minister Fadnavis also did not address the issue of low agricultural wages. Nationally, agricultural workers constitute 90% of the informal rural workforce. The average monthly income of families dependent on agriculture is Rs 6,426 ($99), according to a 2013 report by the National Sample Survey Office (NSSO) on the Situation Assessment Survey of Agricultural Households, the latest available. Households that own less than one acre of land, such as Kamli Babu’s, earned an average income nearly 30% lower, Rs 4,561 ($70). Of this, 64%, or Rs 2,902 ($45), was earned from labour wages. “For the cropping season after the monsoons, my son and I work on other peoples’ farm for our livelihoods. I am paid for my work with food, not money,” Babu told IndiaSpend. Meanwhile, small and marginal farmers’ income from cultivating the land they occupy is 0.6% of their average monthly income, NSSO data show. “I want the government to give me some pension so I can at least retire soon,” the octogenarian Babu said, adding that she had submitted her application to the local tehsildar in 2015 but had not heard back. For the welfare of small and marginal farmers and labourers, who are estimated to constitute 90% of the rural informal sector, the government has instituted five pension schemes under the National Social Assistance Programme: Indira Gandhi National Old Age Pension Scheme, Indira Gandhi National Widow Pension Scheme, Indira Gandhi National Disability Pension Scheme, National Family Benefit Scheme and Annapurna. Housing and non-agricultural employment are also provided under the Pradhan Mantri Awas Yojana (PMAY)-Rural and the Mahatma Gandhi National Rural Employment Guarantee Act (MGNREGA). While the government has announced a 14% increase in funds for the NSAP--from Rs 8,745 crore in 2017-18 to Rs 9,975 crore in 2018-19--this is still Rs 660 crore lower than the allocation in 2013-14 (Rs 10,635 crore), an analysis of budget data shows. Further, the number of beneficiaries registered for the NSAP programme has fallen by 10% between 2014-15 and 2017-18. This is despite Aadhaar enrollment across India reaching nearly 90%. The main reason for this decline in registration is lack of verification of applicants’ identity, a 2015 report by the Comptroller and Auditor General of India said. A Below Poverty Line (BPL) status is the most-widely used eligibility criteria. However, being poor does not automatically get one a BPL card, and having a BPL card does not ensure a pension, a 2014 study in eight states by the Tata Institute of Social Science (TISS) and Pension Parishad found. For example, in Gujarat only 30% of those eligible were receiving a pension, the study said. At Rs 55,000 crore ($8.4 billion), allocations for MGNREGA remain unchanged from 2017-18 to 2018-19. However, in the five years to 2016-17, the proportion of households receiving employment under the programme has dropped seven percentage points from 97% to 90%, IndiaSpend reported on January 29, 2018. Further, 56% workers reported wage payment delays while 15% job-seekers did not find any work in 2016-17, our analysis showed. “We try to break the cycle of poverty but we're constantly pulled back,” Hari Kale, a 38-year-old farmer from Nashik district, said, back at Azad Maidan.